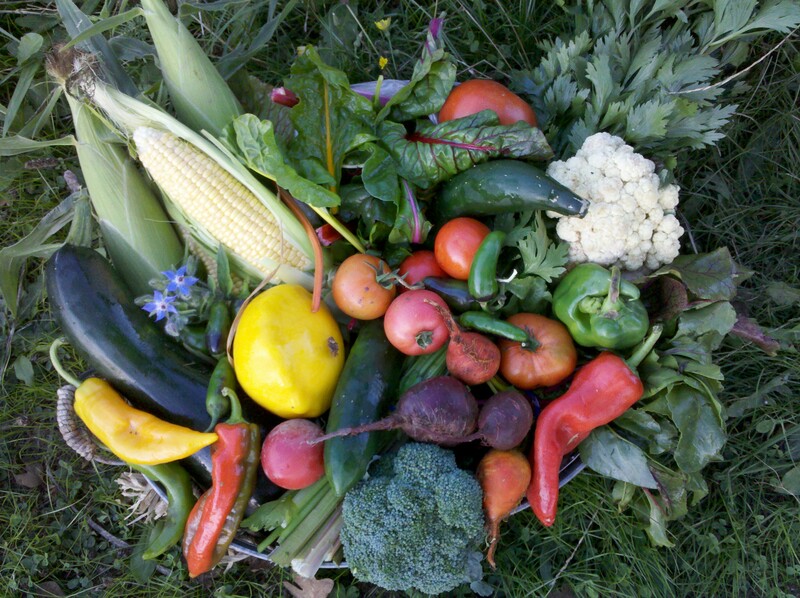 This Weeks Share: Chard, Sweet Corn, a Brassica, Cucumber, Summer Squash, Peppers, Tomatoes, Beets, Beans and Celery. Chard: This week your yummy organic greens are wonderful chard. 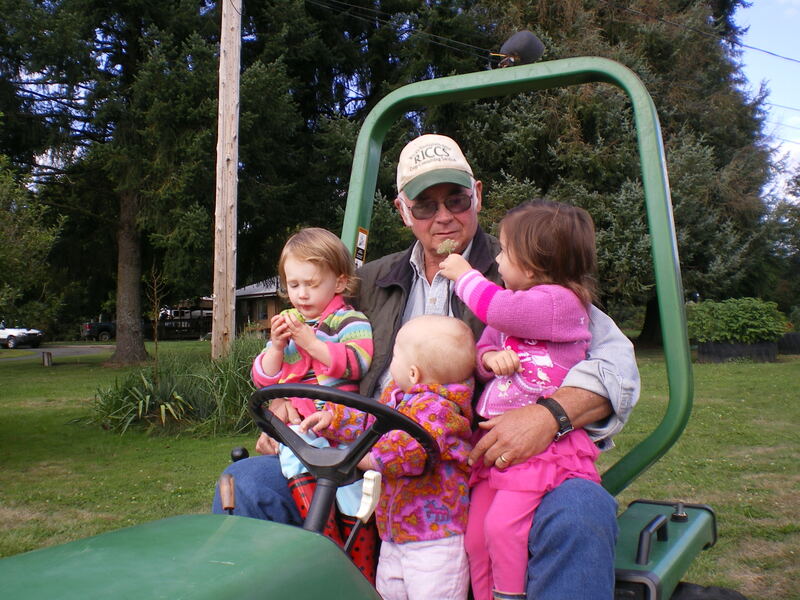 A small note of defense on the topic of ‘big greens’….they are an important part of our diet and of what we believe being part of a CSA represents in the Willamette Valley. This time of year they are great warmed/wilted with a lite vinigarette and some goat cheese or any cheese if you wilt… 🙂 … I know some of you feel a bit bombarded with the greens, but you can always quick blanche and freeze them for later. Yes! This works! So please don’t pass them up. The small leaves are wonderful raw, never bitter. If you’re still at a loss with what to do with swiss chard, here’s a simple recipe that you can come back to, http://www.weheartfood.com/2009/02/taste-the-rainbow-swiss-chard-with-golden-raisins-and-pine-nuts.html. Farmer John’s Cookbook, The Real Dirt on Vegetables has almost the exact same recipe. So do several other folks out there. Sweet Corn: Back in the share this week is what may be the last of our sweet corn. It continues to have an unsurpassed nice, sweet flavor and makes eating your vegetables that much easier. Here’s something new…. http://www.sustainablesettings.org/index.php?option=com_content&view=article&id=93 . This recipe for sweet corn and zucchini salad sounds really great and interesting…corn, zucchini and basil, oh my! 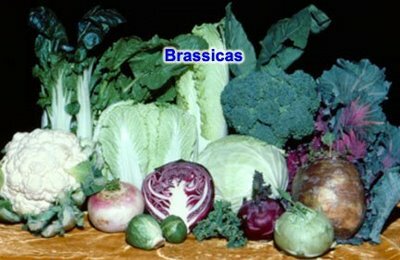 Brassica: This in fact means you will get one of the many different crops that fall into this category including broccoli, cauliflower, bok choy, brussel sprouts or cabbage. Cucumber: Yep…more, never bitter, fresh and crisp cucumber for you. The big ones are great and we are seeing some big ones! The funky shapes are pretty fun too! We eat these every day and they are something I don’t like buying…soon they will be gone and you’ll miss them like us. Summer Squash: This is one of the great years for your summer squash and that will likely mean it’s a not-so-good year for the winter squash. We are in fact seeing low production with most winter squash and especially pumpkins. Sorry about that one members….please enjoy the fresh, thin-skinned summer squash that are easy and quick to prepare and go with most any meal. Peppers: We will have peppers for you in some form this week. 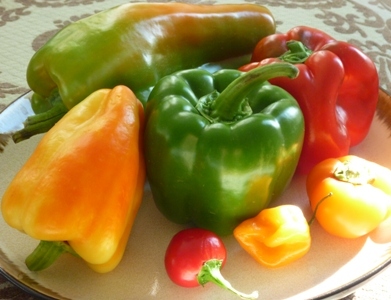 We love all the different shapes and colors of our bell pepper varieties, and other peppers as well and hope you do too. The flavors range from sweet to hot and we have had a rainbow of in-betweenness. Some form of this rainbow will be in your share. 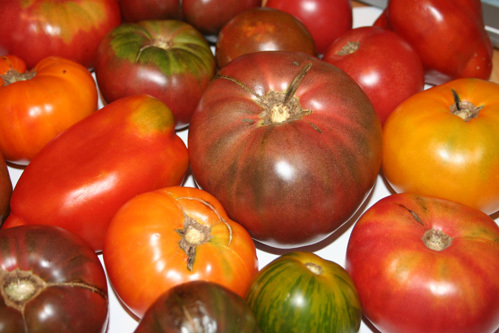 Tomatoes: Nice sized, sweet, ripe, heirloom, red, greenish yellow, yellow, bright orange and dark-greenish red tomatoes are turning every day now in the fields and we gratefully pass them on to you. The year that looked to be the green tomato year somehow turned around for us all. Hooray! Beets: Fabulous root beets are back for another week. You may get golden, red or white ones. The greens are great too! I am so happy to report that I almost always hear sounds of joy rather than regret from you members when you see the beets. You often say how sweet and wonderful they are too. This makes us smile. If you are looking for so,ething new to do with beets, why not give sauteeing them a try? http://blog.fromnanaskitchenwithlove.com/2010/04/farm-fresh-beets-with-spinach.html This recipe looks beautiful! Beans: Week two of lovely string beans for you….we are thrilled! You should be getting great Blue Lake greenies, some purples or some pale golden yellow beans this week. They are all similar in flavor, sweet and easy steamed or boiled. I love this gal’s recipe of golden beans with dill and her blog as well…. http://freshcatering.blogspot.com/2009/07/sultans-golden-crescent-beans-dill-and.html. We didn’t grow this particular seed strain of golden beans, but you get the idea. Enjoy. Celery: This week the fabulous red cutting celery is back for you. The celery flavor has strengthened in the harvest of today and this week and even less like the bland celery of the grocery store. The timing is ripe for cooking this farm fresh gem. Try it in stir fries or a nice creamy soup….http://fromgardentokitchen.blogspot.com/2007/08/cutting-celery.html. I enjoyed this Seattle bloggers description and recipes regarding the featured celery we have…hope you do too. Thanks fabulous bloggers! FARM NEWS: Here we are at week 20. With only 4 more weeks ahead of this one, it is beginning to feel like we’re headed for the dormant season. How about for you? Hopefully you didn’t get caught in the rain today. The skies are forecast not to spill a drop of rain until perhaps Friday, so we’ll see. I want to mention the Annual Fall Harvest Gathering / Work Party Potluck again, so you’ll make a note of it ~ October 17th, Sunday. We’ll be planting garlic from 10am until noon and then gather in our woods for hanging out by the fire, eating, drinking and relaxing. Bring a dish and come share yourself and your farm! We look forward to having you. If you missed it last week I posted the details (scroll down) and I will next week as well. See you soon and happy, healthy eating!